The 10 Best Things To Do In Dubai You Should NOT Miss! Kawaguchiko Japan – Mount Fuji is one of the Land of the Rising Sun’s most important symbols, and one of the nicest villages to visit near Fuji-san is Kawaguchiko in Yamanashi Prefecture with its beautiful lake Kawaguchi. It is little known among Western tourists but it has beautiful landscapes and exquisite cuisine. Let’s talk about this! Kawaguchiko Japan – How To Get There? 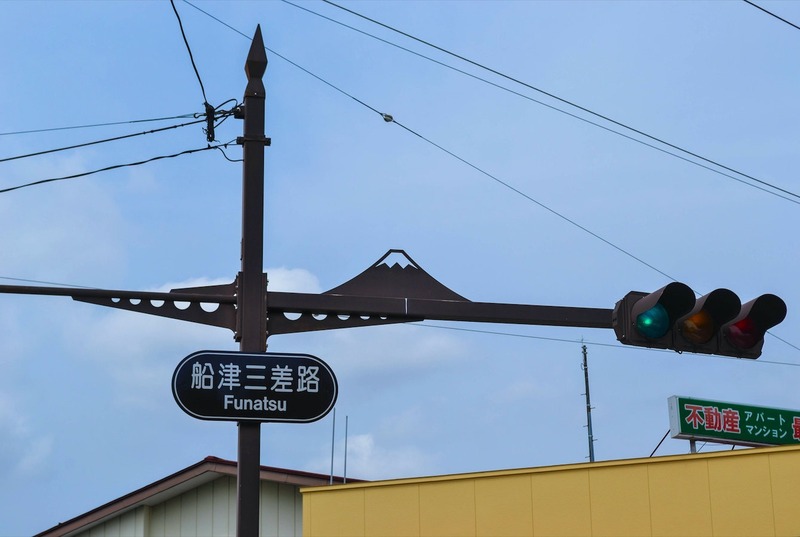 From Tokyo, the easiest way to go to Kawaguchiko is to take the train from Shinjuku Station. 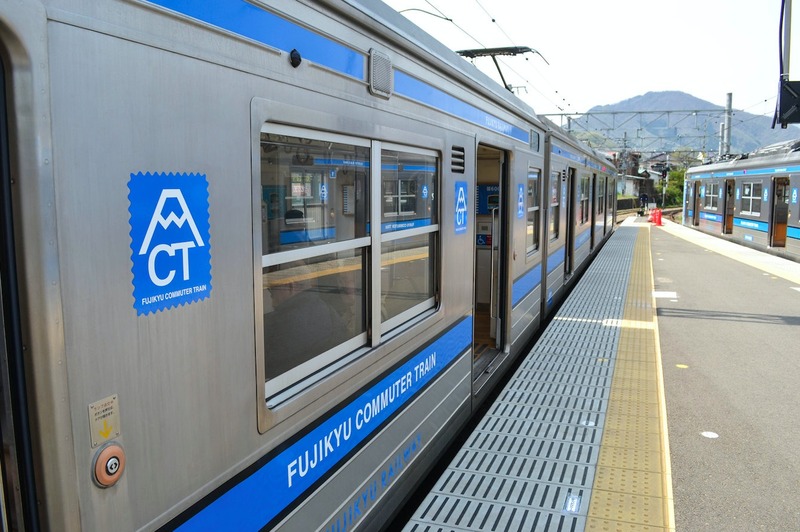 You’ll have to change trains in Otsuki to take the famous Fujikyuko Line that will take you near Mount Fuji. The trip lasts around 2 hours and the round-trip ticket will cost you about 8,000 yen ($71). 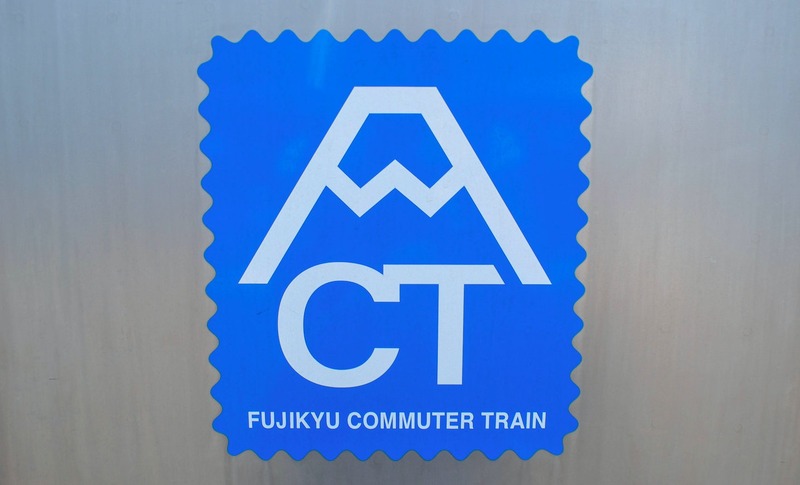 It’s quite expensive, especially since the JR Pass doesn’t cover this particular route. You can also go to Kawaguchiko by bus from Tokyo (Shinjuku). The Tokyo-Kawaguchiko round trip will cost you 3,500 yen so it’s much cheaper than the train. It’s also a direct trip so you don’t need to stop and change buses. The Tokyo-Kawaguchiko bus ride will last a little less than two hours and tickets can be purchased online at this address. 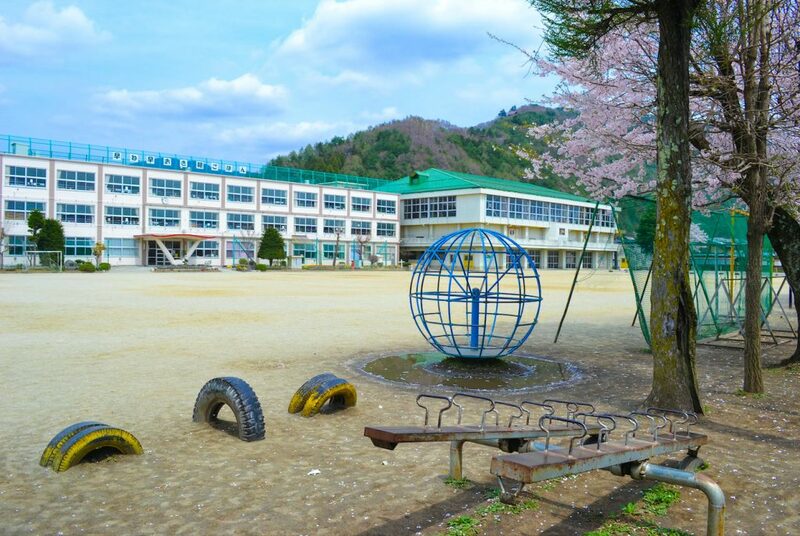 Kawaguchiko Japan – Where to stay? Accommodation in Kawaguchiko is rather expensive, especially if you’re booking a hotel near the lake. 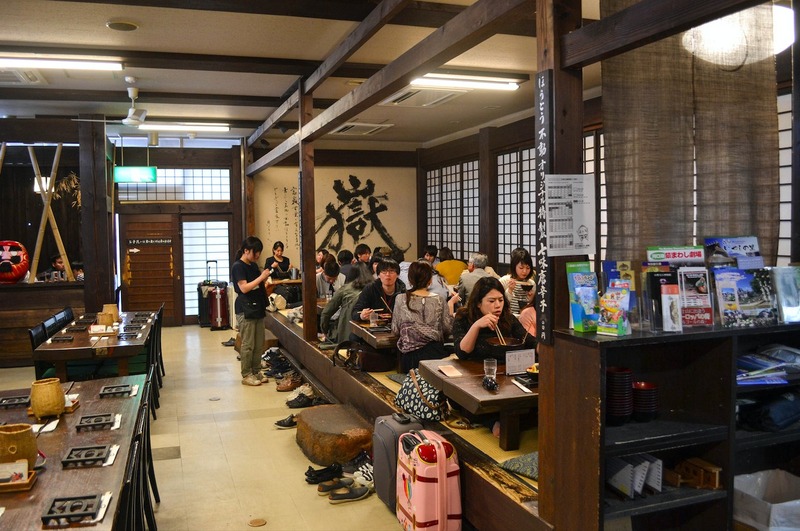 For those of you with limited budgets, I recommend booking at the Kawaguchiko Station Inn. 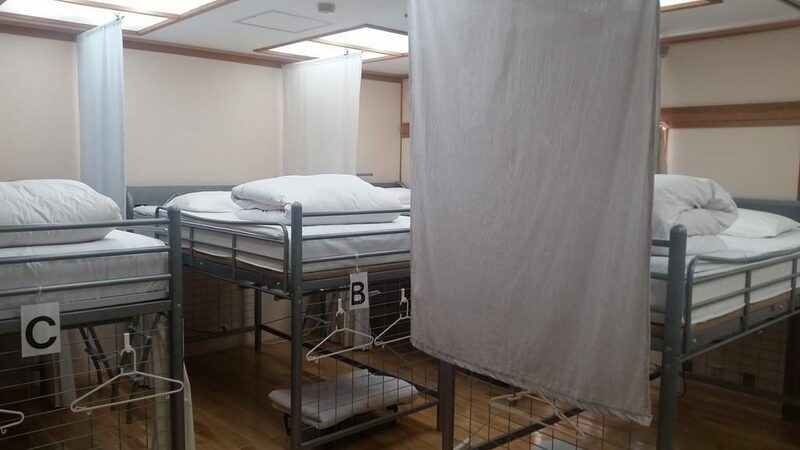 It’s around $30 per night in a dorm room. Make sure to book early though! If you can afford to spend more on accommodation, there are really beautiful ryokan in Kawaguchiko with great views of Mount Fuji. 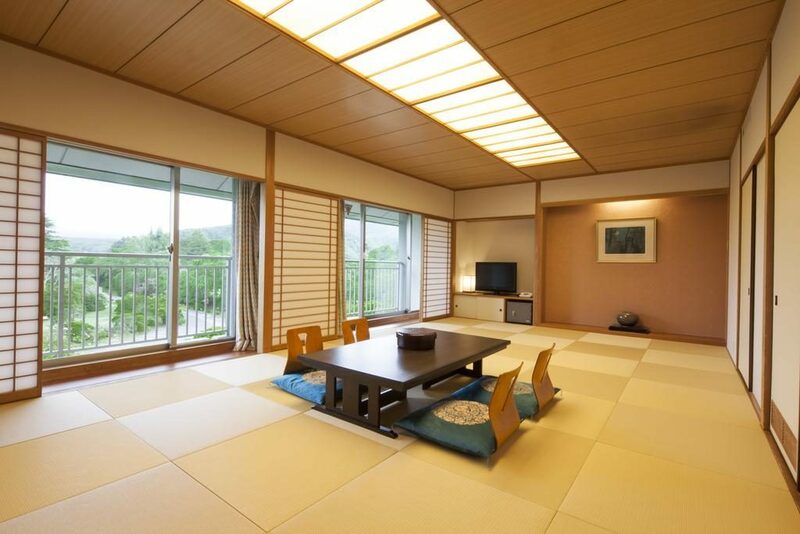 Most Japanese people will tell you that the most beautiful ryokan are in Kawaguchiko. 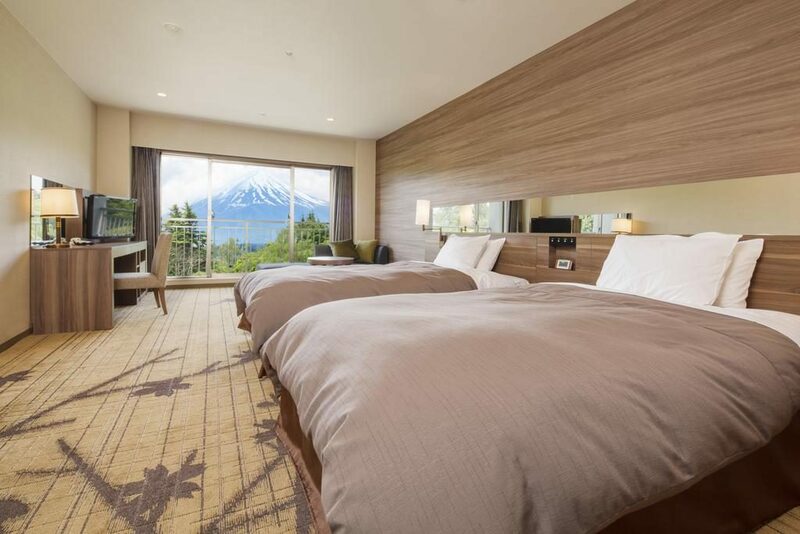 One of them is The Fuji View Hotel, which offers a magnificent view Mount Fuji from the rooms. Kind of hard to beat, isn’t it? 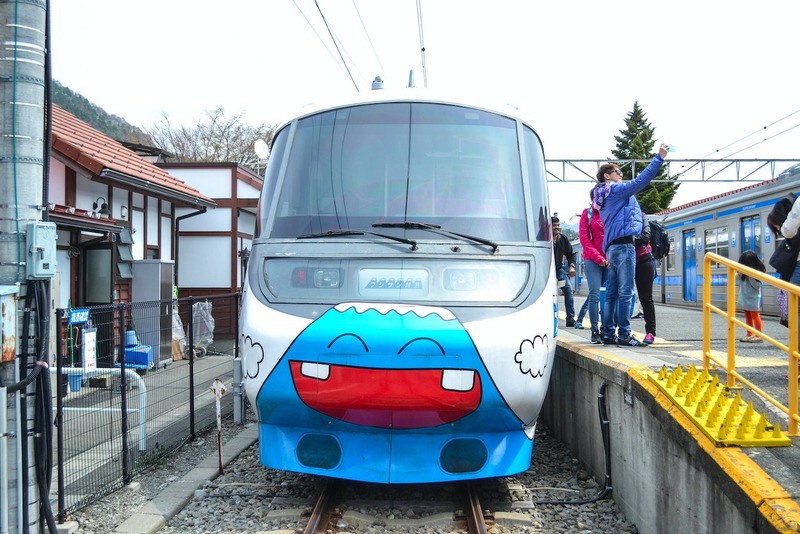 At the Kawaguchiko train station, you’ll get a strange feeling. 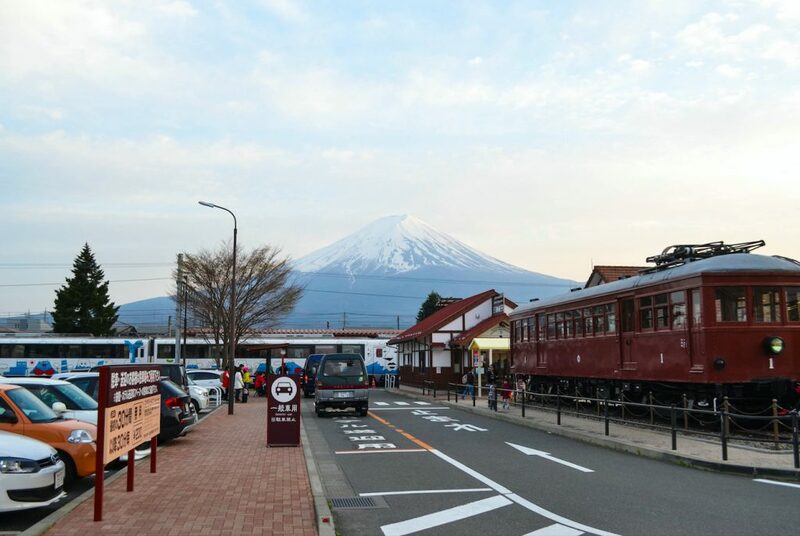 Considering its height and majesty, you might be expecting to see Mount Fuji right in front of you as soon as you leave the station. But you won’t see it until you walk a little further then turn around. Trust me, you won’t miss it this time. It’s massive! The least I can say is that I felt small in the face of nature. 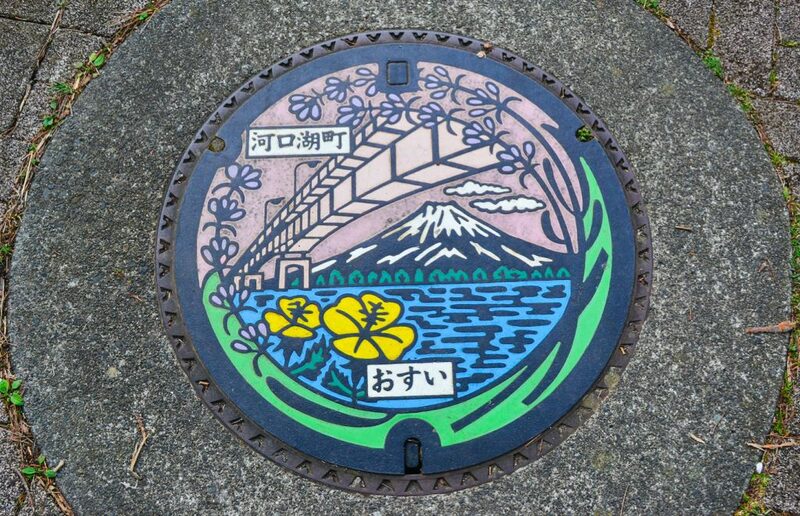 Mount Fuji is more than just a mountain, it is sacred to Japanese people. It is considered as a symbol of strength and power and is even found in Shinto mythology. I encourage you to walk around the station, you come across a nice school there as well as a beautiful temple on your way to Lake Kawaguchi. Wondering how to get the most out of the area? 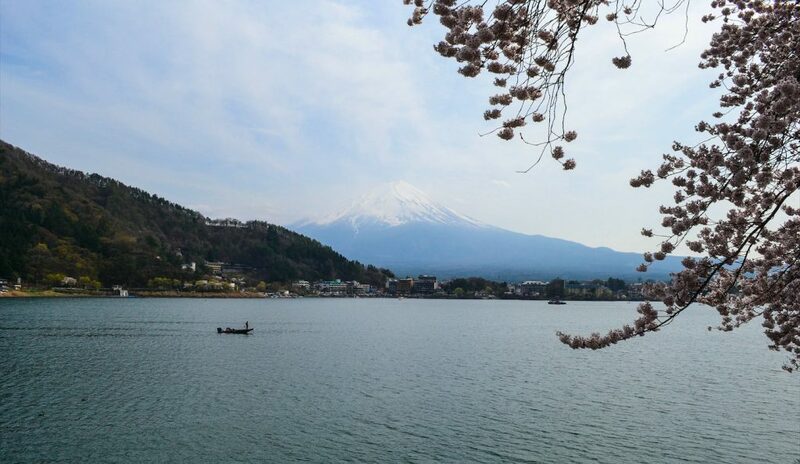 Go for a fun trip around Lake Kawaguchi. You can buy a bus ticket for about $10 (which will be valid all day by the way) and visit the area around the lake. You can also rent a bike if you’d like to add some physical activity and adventure to your day! I didn’t buy the $10 ticket, I just walked around at first then took a cheaper bus back. I was on a budget so I planned accordingly. 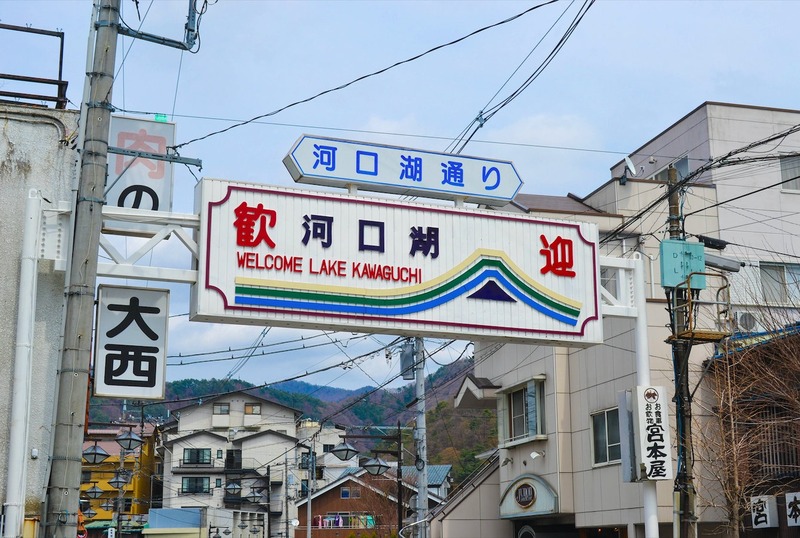 😉 If you head to the lake from the train station, you will first come across the town of Kawaguchiko which has many traditional restaurants and souvenir shops. 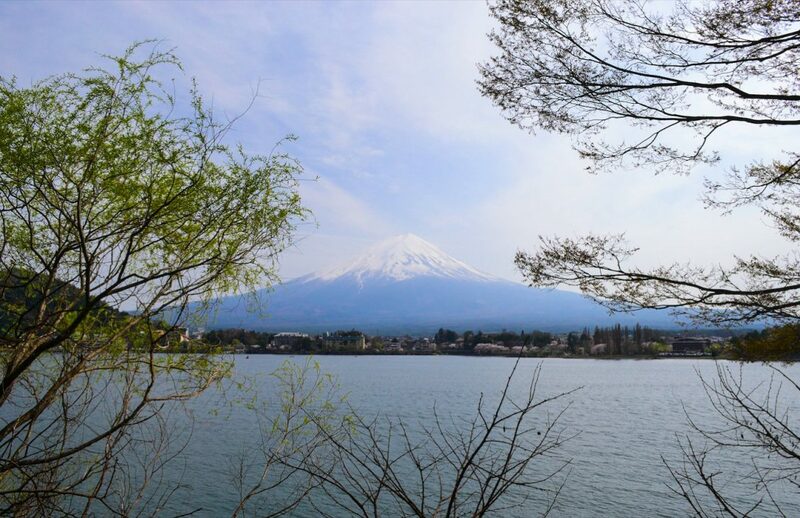 As you get closer to the lake, you will be blown away by breathtaking scenery, with the everlasting Mount Fuji overlooking the whole town. If you’re looking for a more romantic way to tour the area, you can rent a cute swan-shaped boat and take it out onto Lake Kawaguchi. Sail along the lake banks and enjoy the pleasant and peaceful nature around you. When we think of Japan, we often imagine a hectic and ultramodern Tokyo and forget that it has a lot more to offer. But if we really seek to discover the world on unbeaten tracks, towns like Kawaguchiko cannot go unnoticed. For more off the beaten track places in Japan, feel free to check this article too: Japan Countryside. 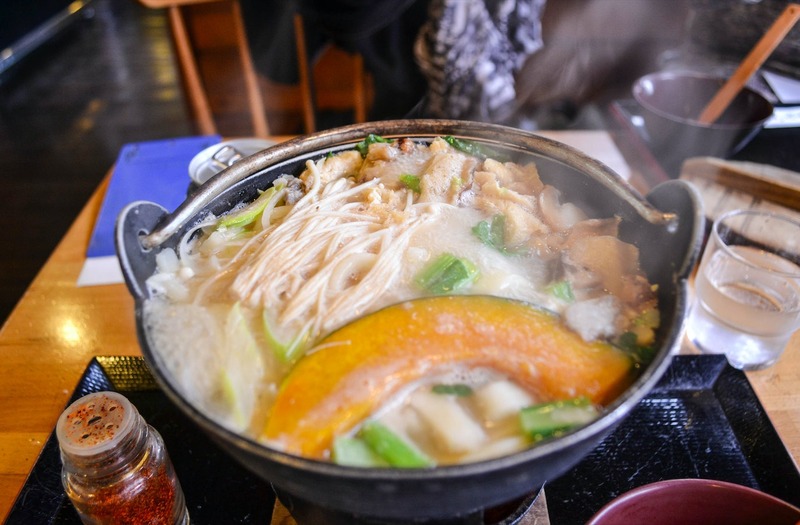 Houtou noodles are the Yamanashi region’s traditional dish. It’s actually made with large, thick noodles in some sort of a miso soup along with various vegetables. The dish is usually served in a pan on a small table food warmer to keep the soup hot enough and ready to eat. The noodles are garnished with fresh pumpkin pieces, small mushrooms, carrots, onions and many other secret ingredients that give the dish a unique taste! You can add meat if needed. By the way, in Yamanashi, Houtou noodles are made with water from Mount Fuji. According to popular beliefs, that’s what gives them their unique taste, so don’t miss out on this delicious local dish! I really loved it. You’d think it’s just a noodle soup, but you have to try it to understand it’s not just any noodle soup! 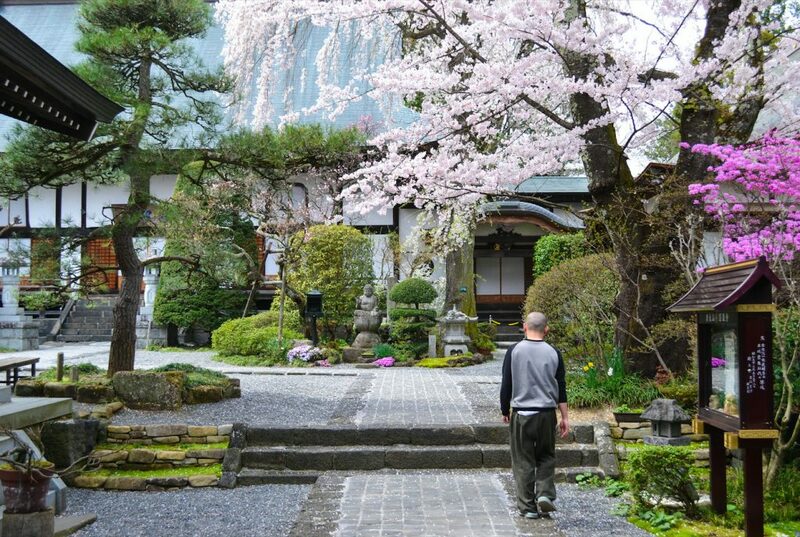 As you can see, if you need a change of scenery (from Tokyo‘s urban vibes for example) and a nice breath of fresh air, spend some time in Kawaguchiko and relax all day long around Mount Fuji. You won’t be disappointed. You have my word! If you have questions or comments, feel free to let me know in the comment section below. Please share this post around, especially if you have friends who will soon be traveling to Japan. You can also subscribe to my Facebook Page, Instagram or Pinterest for more Asian goodness! Miyakojima Japan - The Most Beautiful Island in Okinawa?